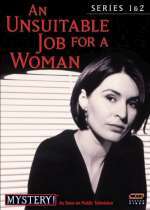 An Unsuitable Job for a Woman: Mystery and Suspense on Television. Cordelia Grey (played by Helen Baxendale) is the reluctant owner of a private detective agency following the suicide of her boss in An Unsuitable Job for a Woman, a series based on the novels by P. D. James. The series originally aired on ITV1. Series 1 and 2 consisted of 2 3-part movies that aired in 1997 and 1998. Two special episodes aired in 1999 and 2001.